NORTON: Cleaning and restoration crews have been busily working inside Grace Brethren Church this week to get rid of the remnants of a fire that forced the congregation to move its worship service to Norton High School. Most of the ashes have been removed. The lingering odor of smoke is nearly gone. The staff is back at work. And while the upper auditorium, where two traditional worship services are typically held on Sundays, is unusable, the church is still strong. damage, but the blaze was limited to the upper auditorium, which needs to be gutted and renovated. The auditorium is where more than 350 worshippers attend two traditional services each Sunday. The lower auditorium is where more than 500 people gather for three contemporary services on Sundays. At least through Feb. 6, the five services will be merged into one at 10 a.m. in the Norton High School gymnasium, 4108 S. Cleveland-Massillon Road. 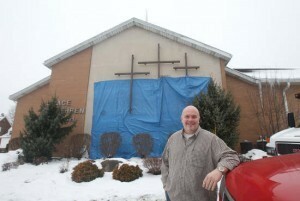 Church officials are hopeful that they can come up with a plan to move worship services back to the church on Feb. 13. The Norton church is one of two campuses of Grace Brethren Church. The Bath campus is located at 754 Ghent Road. Grace Church is part of the Fellowship of Grace Brethren Churches, based in Winona Lake, Ind. The larger Grace Brethren movement, which is considered theologically conservative, includes more than 3,000 churches and exists in more than 25 countries. The Brethren Church traces its roots to 1708 near Schwarzenau, Germany. In the early 1880s, the Brethren (then the Germany Baptist Brethren) experienced a three-way split. The more progressive group formed the Brethren Church. Two groups emerged from the Brethren Church in 1939, after a controversy at Ohio’s Ashland College. Tensions arose when the college, which was controlled by the Brethren Church, began to transition into a secular school with more regional focus and less denominational focus. Some of those who disagreed with that direction established Grace Theological Seminary, which initially opened its doors in 1937 in Akron. The seminary relocated in 1939 to Winona Lake, Ind. That same year, the Brethren Church divided into two conferences — one identified with Grace and the other with Ashland. While the Brethren Church’s headquarters is still in Ashland, Grace Church is affiliated with the Fellowship of Grace Brethren Churches. The fellowship consists of independent churches that share the same doctrines and have agreed to cooperate. Because the Brethren label is not easy to define and tends to create confusion, leaders of the local church intentionally drop it in their name, referring to it simply as Grace Church. Grace Church began in the mid-1940s as a Bible study. The congregation joined the National Fellowship of Grace Brethren Churches in 1958. Two years later, the congregation moved from a refurbished house on 16th Street to its first church building, at the current Norton site. Combs became pastor of the 64-member church in 1973. Under his leadership, the church building and staff were expanded to accommodate the growth in attendance and ministries. In 1995, Combs brought the idea of Judgment House (a walk-through drama that encourages people to choose a relationship with Christ) to the church. The presentation, which attracted more than 100,000 people from 1995 to 2008, helped facilitate growth at the church. In the fall of 1999, the Norton church and the former Fairlawn Grace Brethren Church agreed to become one church on two campuses. The Rev. Jeff Bogue, who came to Grace Church in 1993 as the youth pastor, became pastor at the Bath campus in January 2000. Bogue continues to serve as senior pastor of both campuses and as leader at the Bath campus, which attracts about 2,000 people on weekends.